There have been more than a couple of instances where I got all excited about a toy, but because of its steep price, these have all become just flights of fancy. In the past, I wished for my very own Astromech Droid, Lego Technic, Aibo. And now here comes another toy that I would love to have! The WALL-E Robot Toy has audio and vision sensors, fully-articulating tank treads, remote control (though it can also act on its own), and collision detection. 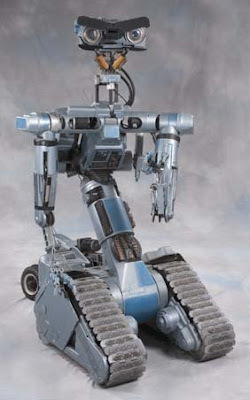 And as an added bonus, WALL-E looks like a younger brother to the 80s character Johnny 5 from the movie Short Circuit! 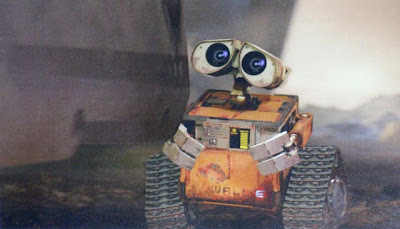 I have seen some videos in the Net featuring the WALL-E Robot toy in action and it's to drool for! But am I willing to shell out US$199.00 for it? I guess I will have to settle for an Origami WALL-E.
WALL-E! Join me, and together we will rule the galaxy!